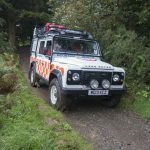 Incident Details: A walker descending Sour Milk Ghyll came across a 50 year old male who had taken a tumbling fall from the difficult slab, and landed head first, suffering a number of injuries. The informant had to descend to Seathwaite Farm to raise the alarm as there was no mobile signal. The Team responded immediately, and North West Ambulance Service despatched Helimed 08 to assist. The location of the casualty was about 250 metres up an extremely slippery, rocky path. 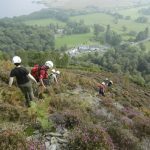 By the time the Air Ambulance was on scene, the Team had undertaken preliminary treatment, and had got the casualty loaded on to the stretcher, for a tricky and strenuous carry down to the valley floor. Paramedics from the Air Ambulance carried out a brief assessment, and were happy for the Team to evacuate the patient.This took about 40 minutes, and the casualty was then loaded aboard the Air Ambulance for transport to Carlisle. The Team waited for Helimed to get airborne, and then stood down.